SITTING councillor and former State Election candidate Paul Belcher is the first contender out of the gate in the 2018 mayoral contest. A spill of all elected positions on the Derwent Valley Council will occur next October with eight councillors to be elected, including the positions of mayor and deputy mayor. Cr Belcher was elected to the council in 2014 after an earlier tilt at the seat of Lyons in the last Stat Election. While unsuccessful in his bid for one of the five vacancies in Lyons, Belcher finished 11th out of the 24 candidates and was the most popular independent candidate. In the 2014 council poll he was elected in second place, behind mayor Martyn Evans. He also finished second in the mayoral contest, ahead of three other candidates. 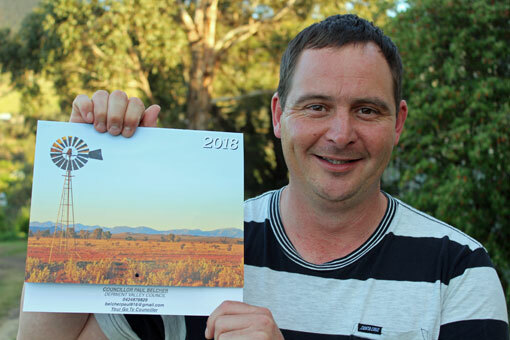 Cr Belcher started his 2018 council campaign last week, advising local contacts of his intention to run for mayor and councillor, and distributing calendars for the new year.